Yesterday afternoon found me at the Westin Hotel's Grand Ballroom for the fourth Annual Awards Luncheon for the Northwest Chapter of the Crohn's and Colitis Foundation of America. As I drove downtown, the weather had me worried, even though the event was obviously inside. If it started raining hard, I might have to park in the Westin's very pricey garage. If it was reasonably dry, I could feed the meters with a pound of coins and walk. Yes, I'm cheap. Luckily, the weather held. The banquet room was already bursting at its seams when I arrived about twenty minutes early. I was expecting a lot of people but was amazed at how tightly packed everybody was. That definitely added some electricity to the event and made going through the silent auction line somewhat of an ordeal. We were let into the ballroom right at 12 noon and I was able to briefly chat with the other 9 people at my table, all whom were very amiable. The middle-aged woman on my left reviled me with horror stories of her medical condition, but the only other mild-negative for the whole event (other than forgetting to take some pictures with my cameraphone) was the meal's entree: what appeared on the plate to be a nice, big flaky, piece of fish turned out to be something quite different--I think it was chicken. The lack of a readily-identifiable taste/texture of the questionable creature was somewhat disconcerting, as well as indigestible. But I digress. The program started off with a bit from Pat Cashman, who handed off to Tony Ventrella, who handed off to my buddy Steve Wright, the foundation's Executive Director. Other speakers included a very poised 14-year old Chelsea Nofield, representing a youthful perspective on living with Crohn's disease (a serious digestive disorder). I was quite amazed that she was able to carry herself so well in front of such a big audience. Equally impressive was Cody Shadle, a guitar-playing teenager, who shared his experiences with Crohn's as well as how much he was helped by the CCFA-sponsored Camp Oasis, which he said was a life changing event. Very cool speakers. Next up on the podium was Mike McCready, guitarist from Pearl Jam, who has kind of spearheaded the entire luncheon thing and has become a big part of local fundraising and awareness efforts, particuarly since he publicly disclosed a few years ago that he also suffers from Crohn's. 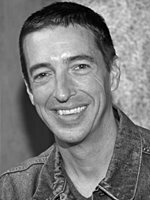 Finally, it was time for the luncheon's featured speaker, Ron Reagan, whom I had really been looking forward to hearing. He bounced up onto the platform, looking very energetic and stylish in his black-on-black linen outfit, the true picture, perhaps, of a professional speaker. His 30-minute talk was at times serious, at times humorous, but always inspirational. The Seattle-area resident touched on things dear to most liberal's hearts, including healthcare reform (universal coverage) and stem-cell research, and how the present administration is blocking both. Very little was said of his rather better-known father, and then it was only in passing, in a very-detached and objective manner. I found his message very appealing, and was somewhat surprised that he was not given a standing ovation. The event ended with an exciting live auction for an X-box 360 autographed by Bill Gates and four box-seat tickets for next year's Super Bowl, provided by the Seattle Seahawks. CCFA's mission statement is "To cure and prevent Crohn's disease and ulcerative colitis through research, and to improve the quality of life of children and adults affected by these digestive diseases through education and support." To learn more, go to http://www.ccfa.org/chapters/northwest/ . Never having been to one of these things I found your account very interesting. Of course I focused right in on the food. The wonderful Calvin Trillin had an essay somewhere in his vast writings where he speculates that there's a factory somewhere producing enormous amounts of chicken a la king for just these occasions. But that's from the 60s and the flaky fish/chicken sounds much more up to date.